A drug addict driver who killed a motorcyclist and caused catastrophic injuries to his victim’s pillion passenger was jailed yesterday (Monday) after a court heard he fled from the scene, driving off to take cocaine. Daniel Pryce had two young children in the Ford Galaxy people carrier he was driving when he overtook another car and drove straight into the path of the oncoming motorcycle. 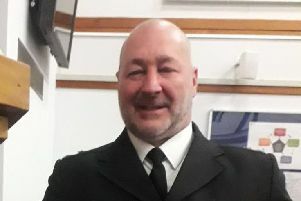 The motorcyclist Martin Elam, 47, from Donington, suffered fatal injuries as a result of the incident on the A52 at Aunsby south of Sleaford, on August Bank Holiday Monday last year. His passenger and partner Trudy Edgington was left registered disabled after she suffered fractures to her right femur, right leg, foot and ankle as well as broken ribs and a fractured eye socket. After leaving the scene of the collision Pryce later stopped and made six other phone calls before ringing for an ambulance. Pryce, 40, of Parklands Drive, Harlaxton, was jailed for six years and eight months at Lincoln Crown Court. He was disqualified from driving for eight years and four months. Pryce admitted causing the death of Martin Elam by dangerous driving and causing serious injury to Trudy Edgington by dangerous driving as a result of the incident on August 28, 2017. The court was told that Pryce, who was driving unsupervised, only held a provisional licence and was not insured. At the time of the fatal crash he was on police bail after being arrested for an earlier offence of driving while over the limit for drugs. Judge Andrew Easteal, passing sentence, described Mr Elam as an exemplary driver and said no blame could be attached to him for what happened. Judge Easteal said that the overtaking manouvre carried out by Pryce which caused the fatal crash meant a collision was unavoidable and inevitable. Robby Singh, prosecuting, said that moments before starting the overtaking move Pryce had been driving so close to the vehicle in front of him that other drivers thought he was being towed. He then moved out and straight into the path of Mr Elam’s motorcycle. As a result of the collision both Mr Elam and Ms Edgington were thrown from the motorcycle, the court was told. Passing motorists stopped to help and Mr Elam asked them about his partner before he was taken to hospital. He died during the journey. Ms Edgington, who is still on crutches and needs assistance with every day living, was taken to hospital where she was detained for a number of weeks. Mr Singh told the court: “Although the defendant called for an ambulance it was only the seventh phone call he made after the collision. “The defendant’s mother states that he has been struggling with drug addiction for 20 years. “On the Bank Holiday Monday he said he wanted to drive over to see her. She told him not to because he had no licence. “He texted her to say he had run out of drugs and she suspected he had run out of money. After his arrest Pryce told police he had injected himself with a mix of cocaine and the heroin substitute drug Subutex saying he took the drugs to calm himself down. Trudy Edgington told the court she has been left devastated by what happened. In a statement read out in court she told how her partner shouted out over the radio link they had set up so that they could talk to each other during motorcycle journeys. The couple were returning to their home in Donington after a day out at Matlock Bath. Mark Watson, in mitigation, said Pryce was remorseful and had admitted the offences. “He did not set out to injure let alone kill anyone on that day. “He is clearly a man who has lost his way. He comes from a good family but found himself at a young age addicted to Class A drugs.